Steven Holzner is an award-winning author of science, math, and technical books. He got his training in differential equations at MIT and at Cornell University, where he got his PhD. He has been on the faculty at both MIT and Cornell University, and has written such bestsellers as Physics For Dummies and Physics Workbook For Dummies. Part I: Focusing on First Order Differential Equations. Chapter 1: Welcome to the World of Differential Equations. Chapter 2: Looking at Linear First Order Differential Equations. Chapter 3: Sorting Out Separable First Order Differential Equations. Chapter 4: Exploring Exact First Order Differential Equations and Euler’s Method. Part II: Surveying Second and Higher Order Differential Equations. Chapter 5: Examining Second Order Linear Homogeneous Differential Equations. Chapter 6: Studying Second Order Linear Nonhomogeneous Differential Equations. Chapter 7: Handling Higher Order Linear Homogeneous Differential Equations. Chapter 8: Taking On Higher Order Linear Nonhomogeneous Differential Equations. Part III: The Power Stuff: Advanced Techniques. Chapter 9: Getting Serious with Power Series and Ordinary Points. Chapter 10: Powering through Singular Points. Chapter 11: Working with Laplace Transforms. Chapter 12: Tackling Systems of First Order Linear Differential Equations. Chapter 13: Discovering Three Fail-Proof Numerical Methods. Chapter 14: Ten Super-Helpful Online Differential Equation Tutorials. 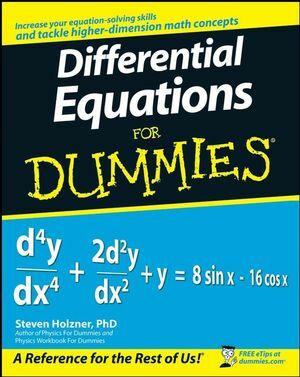 Chapter 15: Ten Really Cool Online Differential Equation Solving Tools.